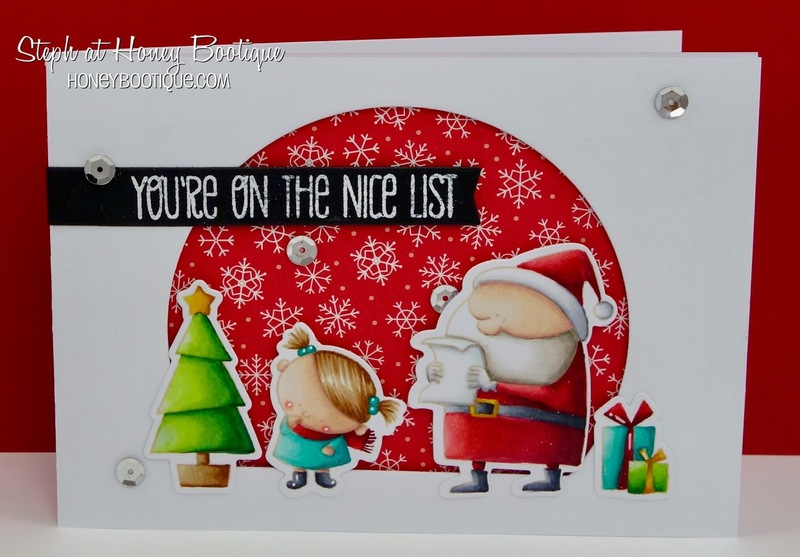 Honey Bootique: MFT- You're On The Nice List! MFT- You're On The Nice List! So I'm rolling on with the Christmas cards- how are you all doing with your's? I coloured the images with no-line colouring technique. I love how the little tree turned out! I then cut out with the matching dies. I die-cut an aperture using the MFT Stitched Arch Stax into a panel of white card. I adhered some DP onto the card blank and then raised the aperture panel up on 3d foam pads and adhered to the front of the card blank. I then arranged the little characters in front and stuck them down with a mixture of 3d foam tape and simple double-sided tape. I white embossed a sentiment on a die-cut banner and added. Finally added some sequins. I am provided with free products for promotional purposes as part of the Stamping Bella Design Team. All content (text, photographs, and design work) is © Stephanie Hill 2009-2018. I put a lot of time and effort into my designs. I would appreciate if you would use them for personal inspiration only. Please do not reproduce them for publication/profit, design team work or contest submission. I am more than happy for you to CASE my work but please credit me with the original design with a link back to my blog.